Kirk Broadfoot thought Ibrox assistant Ally McCoist was joking when he phoned to break the news of the Rangers defender's Scotland call-up. Broadfoot, 24, was drafted into George Burley's squad for the World Cup qualifiers with Macedonia and Iceland after team-mate David Weir pulled out. 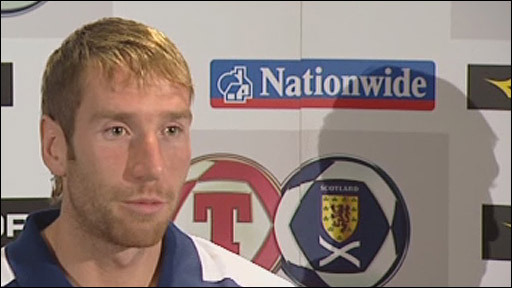 "I got a phone call from Coisty and I thought to myself, 'he's winding me up'," said Broadfoot. "The more he talked the more I realised he was serious. I couldn't believe it." Broadfoot, however, was eventually persuaded that his inclusion was genuine and was delighted to cancel plans for a holiday. "It's the type of thing Coisty or Kris Boyd would do," Broadfoot continued. "He (McCoist) was over the moon as much as I was, to be honest. When it did sink in, I was thrilled about it. "I'd been planning a few days away with my missus and was in the process of booking a trip to Marbella when the call came. "But this is a great bonus for me." The 24-year-old, who joined the Ibrox club from St Mirren in 2007, has been capped for Scotland at U21 level as well playing twice in B internationals.